It was back in 2002 that Jamie Oliver created his apprentice scheme for young people to train as chefs. He mortgaged his house to raise the funds for an idea that many thought was crazy. He recruited from unemployed or those who need a break in life. None were used to getting up early in the morning nor did they have any concept of routine. The first fifteen were a challenge. There are now three Fifteen Restaurants, London, Cornwall and Amsterdam. Every year each Fifteen restaurant recruits 18 apprentices between the ages of 18-25 every year for a 12 month tough chef training program. The restaurant puts all its profits back into the charity but that doesn't cover all the costs. 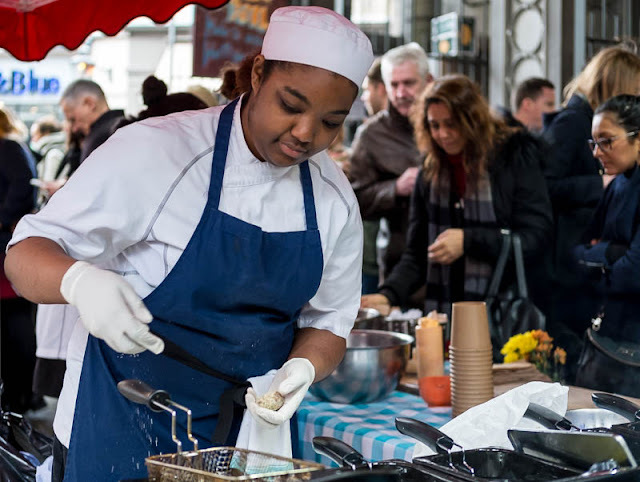 Some of the aspiring new young chefs were displaying their skills at Borough Market yesterday to help with the fund raising efforts. I thought this was such a great idea when I first heard about it. I'm glad to hear that it's still going. I own two Jamie Oliver cookbooks and I did eat at his pizza place at Covent Garden when I was there last. That place he partnered with a chef from here in Phoenix. A brilliant idea! I have 5 of his cookbooks! Good for them - and for Jamie. Lets hope the idea spreads to other employers.